I sit writing these words in the ‘cold glow’ of early December a few weeks after the Autumn Statement by the Chancellor, Philip Hammond, trying to find some crumbs of comfort. It is always good news that I might possibly get to work a little quicker in the future, (he committed to investing in transport infrastructure!) but seemingly not in improving the health of the public in England at least – a view for which the Govt in England were heavily criticised by many if not all independent political commentators. The problem as we know (my crystal ball tells me that by the time you read this, it will still be true! ), is that working in the ED is only part of much wider distress affecting most acute healthcare systems in the UK & Ireland as funding becomes ever more drastically squeezed. Our core job is now more challenging than it has been in over a decade with the average four hour system performance sitting at approximately 81% in England, confirmed by the RCEM Winter Flow project launched in Dec 2016, with some systems having recurrent performance at 65-75%. In Wales & Northern Ireland it is often worse. 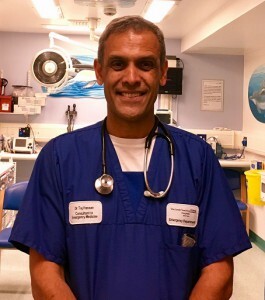 Our staff will continue to apply their very best skills to maintain safety and deliver clinical care but will be compromised by the appallingly overcrowded environment which sees them spend time caring for the ill and injured as well as half a ward or more full of patients who are just waiting for a hospital bed. Beds are of course becoming a luxury item in the NHS and the numbers as they say give the game away. Indeed, the number of beds in the UK & Ireland comfortably sit in the bottom 3 of the recent OECD figures (2.7 and 2.6 / 100K population). In these austere times it’s especially tough for us all involved in acute healthcare. The news is not all bad though. Our colleagues in Scotland have begun to see some progress and results from the Scottish government’s commitment and wise investment in urgent and emergency care systems over the past 3-4 years. I congratulated Martin MacKechnie, Vice President, and the RCEM team in Scotland on their hard work of the past few years in collaborating and working with local policymakers to help improve matters when I visited recently. Indeed system performance there is now almost at 95%. A powerful message indeed for those seeking evidence of what sound investment in staffing, clear focus on systems engagement combined with steely determination can produce to deliver safer care. We also know that there are a small number of systems in the rest of the UK that are also performing well despite a continuing rise in demand. The common themes are Executive Boards that have listened to Clinical Directors and their teams in ED in key areas. These include innovation and proper investment in multi-layered staffing structures over a number of years, system front ends to allow multiple routes of entry so that the ED caters for the patients it can most help and wider system resilience with leadership in the community and social care to allow more integrated care. We should and will as a College continue to showcase such examples so that when wider investment does begin to flow again (as it must! ), the money can be used wisely. Work on many other fronts continues to progress at pace and time does not easily allow me to describe it in any great detail. Please do visit the award winning RCEM website and you will see progress on our new strategic themes building on the past. A major part of that work is of course staffing. I am keen that we describe clearly and engage with policymakers on what ‘good looks like’ for an MTC or equivalent, for mid sized systems and also for smaller/remote and rural systems. These issues will be especially pertinent as reconfiguration plans emerge in England (STPs) as well as elsewhere. We are also doing work on sustainability with regulators and allowing them to better understand the intensity of work that the emergency physician does especially out of hours. I hope we can have some news on these key areas in the coming months. If you really want to be left with a ‘warm glow’ then I just want to share with you in a few words the superb, uplifting experience that we had in the company of HRH Princess Anne who led in giving 210 diplomas to new graduates of the MRCEM & FRCEM in early December. Combined with that were Alison Gourdie medals for Sara Hickin (top MRCEM mark), Clare O’Connell (top FRCEM mark) and James Wallace (top North West mark) who won the Luka Randic medal. In addition we celebrated with College medals for Kevin Reynard for his excellent College contributions for over 14 years and to Anne Hicks for her outstanding and leading edge work in the field of mental health in the ED over the past 15 years. Finally, we were very pleased to grant an Honorary FRCEM to Mr David Wilkinson, the Lead Postgraduate Dean for HEE who has made so much effort to work closely with us over the past few years to help in improving recruitment and retention of trainees – unfinished business for sure. Indeed we are making great progress with David and his colleagues to make sure we get this right for our trainees. My recent invitation to an annual study day with the 200 or so London trainees was a real marker of the passion for the specialty but also the importance of getting key issues right at the grassroots – thank you for your honesty and feedback that day. I hope we can make progress in key areas soon. Finally, of course, it is a real pleasure to continue to visit and meet so many of you at regional and national meetings that are being held by Regional and National Chairs of Council. Thank you all for your continuing support of the College in all its activities especially in exams and education. I look forward to visiting other regions very soon.